What is Cinuforce nasal spray? 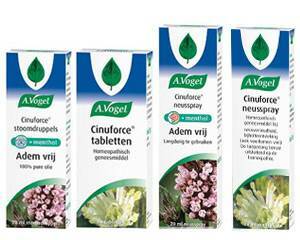 Cinuforce nasal spray is a homeopathic medicine of the brand A. Vogel. It contains natural ingredients, such as Cinnabaris D8, which shrink the nasal mucosa and drain excess mucus to make the passage to the cavity free. This eases sinus pressure and reduces symptoms such as headache, pressure behind the eyes and nasal congestion. Cinuforce nasal spray does not contain synthetic ingredients and is therefore also safe for use in children. Cinuforce nasal spray helps to relieve nasal symptoms such as a runny nose, nasal congestion and other symptoms caused by the flu, cold or a sinus infection. It can also be used to prevent a nose cold from developing into sinusitis. Cinuforce nasal spray comes in an easy-to-use metered dose pump spray. For precise instructions on how to use the spray, see the package leaflet. The nasal spray can be used as frequently as needed to relieve nasal discomfort caused by the cold. It is suitable for long-term use if necessary. The A. Vogel Cinuforce range also includes other products such as Cinuforce steam drops, Cinuforce menthol spray and Cinuforce tablets. Children aged 2 to 6: one spray in each nostril, two to three times a day. A. Vogel Cinuforce is generally well tolerated. Should you experience side effects that are severe or persistent, consult a doctor. There are no contraindications for Cinuforce nasal spray. If in doubt about whether to use it or not, consult a doctor. Cinuforce nasal spray is safe for use by pregnant and breastfeeding women. If in doubt, consult a doctor prior to use. This product does not affect your reaction time or impair your ability to drive safely. Cinuforce nasal spray does not interact with alcohol.